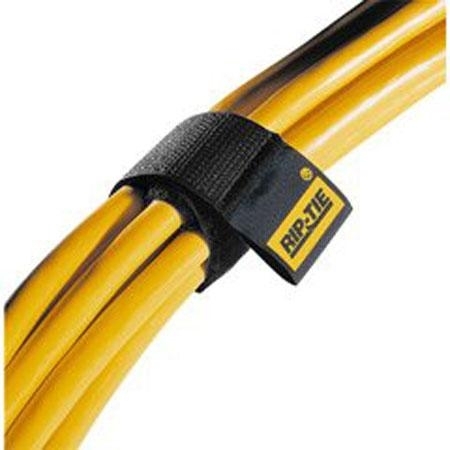 The Rip-Tie 1 x 14" Heavy-duty CableWrap (10/Pack, Black) is a re-usable "hook and loop" fastener that keeps cables neatly and safely out of your way. One end permanently attaches to the cable; the other end has a pull tab to free it with one hand. It is made of hook and loop touch fastener material that has been tested for 10,000 closures with no loss of holding strength. This medium-size CableWrap organizes cords on small appliances and portable power tools, removable power cables, short extension cables and most cables up to 25' long. Dimensions (W x L x Diameter) Exterior: 1" x 14" x 1.5"